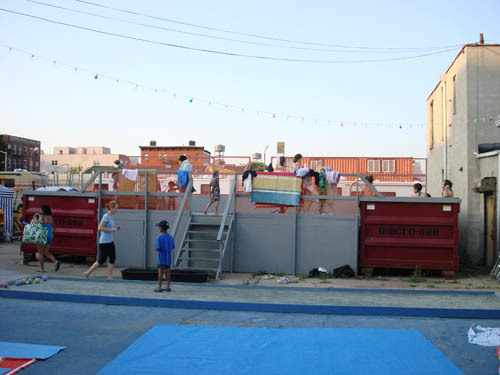 So last Friday, I was invited to the Dumpster Pool Party in Brooklyn. Havent heard about it? Read the NYTimes or see the how Macro Sea's puts it together on ReadyMade. The party themes change, guests vary, but the dumpster pool remains as the main attraction. Once you figure out the exact location, getting in is actually no problem--you dont have to drop any names at the gate or tip the guy sitting on the folding chair--you just casually walk on in-- through a narrow brick building side entrance, and into an open lot. It's meant to be a community destination-- but because of the limited space of the pool, invites are discreet. 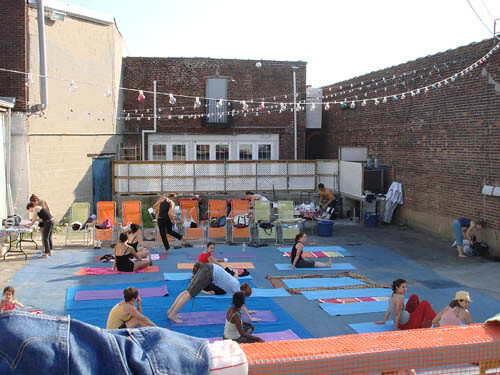 On August 14, Loose Chain Yoga Studio held an open event, welcoming hipsters, parent hipsters with kids, yoga fanatics and the like for a free class at the Dumpster Pool. What more could you want on a Friday afternoon? A little downward dog stretch and sunbathing in a dumpster. 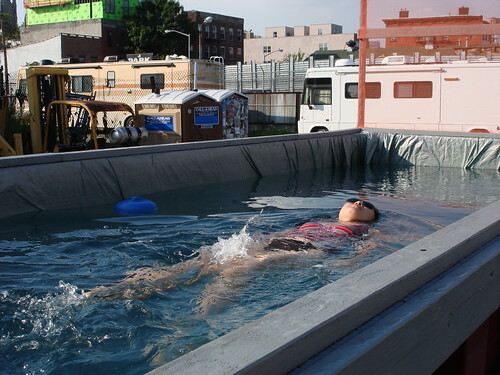 In case youre grossed out by the whole concept of swimming in a dumpster-- 1. its clean 2. padded with sand for cushioning at your feet 3. has sand benches built in so you dont just stand there 4. fully lined 5. easy to climb ladders to go in and out of the pool 6. has a water filtering system like a regular pool 7. there is no 7. It's a great experience! 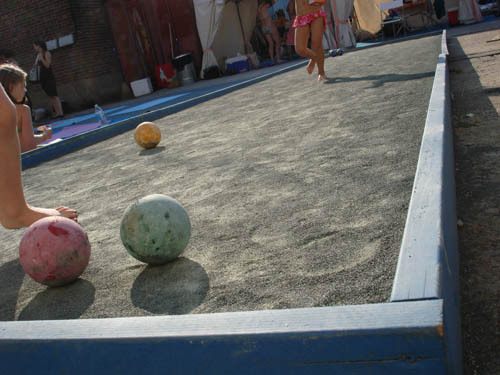 Oh and the have bocce ball. A little something for everyone at the Dumpster Pool.